There are numerous farmers markets around the state of Louisiana. Shop locally and support your local farmers and fisherman. Farmers Markets are often the perfect place to purchase heirloom fruits and vegetables. When supermarkets became the common place to purchase produce the fruits and veggies passed down from generation to generation lost favor to the easier to pick and ship hybrids. Now, heirlooms are back in style. They generally taste a lot better than their mass-market cousins. Some markets e.g. Rouses carry heirloom tomatoes but for more exotic heirlooms try your local farmers market. Note: If you don't see your farmers market listed or would like to correct a listing, let us know. Mention "farmers market" in your email subject. Contact us here. Haughton Farmer's Market (Summer Season) is from mid-June to mid-August. The market is located at Fred’s Store, 400 W. McKinley Avenue, Haughton. Hours are from 8am to Noon. Fresh heirloom organic produce, canned foods, baked goods, and various crafts. This market was created as a community event and public service for the local area. We pride ourselves on being locally grown. We do not allow any produce resellers. 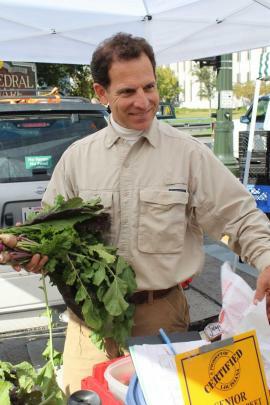 Our produce vendors attend garden seminars each February. (Fall Season) is October and November. Hours are 10am to 4pm. at 400 W. McKinley Avenue. All events are weather permitting and may be rescheduled to Sunday. Call 318-949-9592 for more information. Heirloom Farms located at 895 Allen Town Rd in Haughton, Bossier Parish. Roadside stand hours are Tuesday and Wednesday 10am to 1 pm. Fall Produce stand times are Tuesday and Wednesday, Noon to 2 pm. We take advance orders for easy pick up during stand hours. We grow only heirloom organic produce from all over the world. Tomatoes, Red and Black variety Cherry tomatoes, Eggplants are Black Beauty (purple bell) and Ichiban Eggplant (slender purple) from Japan, Okra, Red Burgundy Okra, California Wonder Bell Pepper. Hungarian Hot Wax Pepper. Big Jim Hot Pepper, Serrano and Ancho Peppers, Straight 8 cucumbers, Yellow straight and crookneck squash, Zucchini, Acorn and PA Dutch Crookneck (neck pumpkins), and Adele Tingle Pie Pumpkins, and three types of watermelon – red, orange and yellow. Fall Produce: Collards, Mustards, and Tender Greens, various winter squash, green tomatoes, melons, okra, and so much more. Call 318-949-9592 for more information. The Jeanerette Farmer's Market is held the 2nd Saturday of every month at Jeanerette City Park from 8 am until 12 pm. The market features farm produce and hand made items from the Jeanerette Area. The Delcambre Seafood & Farmers Market is located under the Pavilion at Bayou Carlin Cove in Delcambre, LA, open the first Saturday of each month, from 9a-1p. Customers can buy fresh seasonal shrimp right off the boats docked next to the market. We also offer a large variety of fresh frozen seafoods: lump crab meat, crawfish, shrimp, catfish, black drum and more. Over 40 vendors offer homegrown vegetables, unique crafts, jewelry, artisan foods, clothing and more. Visit us March through December. For more information, go to Web Site. Harahan now has a Farmers Market. We are opened the 2nd and 4th saturday of every month rain or shine 8AM til Noon. We have a lot of local vendors with fresh produce, honey, goats milk soap, crafts and candies. Located at 6437 Jefferson Hwy, Harahan, LA 70123. Behind City Hall. 303 Williams Blvd. Historic Rivertown. Opens May 19th. 8:00 a.m. 12:00 noon, first and third Saturday of every month. Fresh produce, crafts, woodworks, jewelry; baked goods, a variety of hot plates. 484 Sala Avenue at 4th St. Saturdays from 8:30 - 12:30. Fresh produce, desserts, crafts, jewelry, flowers and plants, variety of hot plates. Summer and fall, free concerts on Friday nights. 7:00 p.m. 10:00 p.m. See calendar of events and Visit Web Site. Freetown Farmer's Market Every Wednesday & Saturday. Wed. 2-6 p.m.; Sat. 10 a.m.-2 p.m. At The Freetown Studios, 421 Convent St., Lafayette Visit Web Site Fresh Locally Produced Produce, Meats, Body Products, Breads, Jams, Crafts, and More! We are open rain or shine! Farmers' Market, "Le Petit Magasin de Scott" The Farmers Market is open every Saturday from 7am-12noon (March-October). Always a family friendly atmosphere. Click here to view the rules, regulations, and vendor fees. Feel free to call City Hall at 337-233-1130 for more information. Thibodaux Main Street Farmers' Market 314 St. Mary Street, the Farmer’s Market is located next to Jean Lafitte Park across from the Carrot Patch. Sat. 7:00 a.m.-11:00 a.m. Spring & Fall (Schedule announced locally) Variety of fruits & vegetables in season Joyce Benoit (985) 448-1474 Check our website for additional details, as bad weather conditions may affect the market. Lafourche Central Market 4484 Hwy. 1 @ U.S. 90 in Raceland, LA Open Saturdays 8:00 am - Noon. Open air pavillion with restrooms, stage for entertainment and space for 32 vendors. For more information contact Brandi LeCompte at 985-438-1231. In front of ARISE Academy at Dr. Charles Drew Elementary School, 3819 St. Claude Avenue, New Orleans, LA 70117 WHEN: 10:00am - 2:00pm every Saturday, rain or shine. Live music every week from 11:00am - 1:00pm. WHY: The Sankofa Farmers Market is a project of Sankofa Community Development Corporation, a nonprofit that serves residents of the Ninth Ward and surrounding areas by addressing the social determinants of health, supporting diets rich in fruits and vegetables, and helping to decrease cardiovascular risk factors. Sankofa CDC works to increase access to fresh healthy produce and educate residents about the importance of growing and consuming healthy foods. WHAT: Fresh produce, prepared foods, and food trucks. Products are local and seasonal, and include vegetables, fruits, herbs, tofu, live crabs, starter plants, healthy snack foods, sauces and dressings, shiitake mushrooms, artisan breads, and more. For more information, visit www.sankofanola.org. Follow us on Twitter: @SankofaNOLA. Bayou Teche Farmers Market 203 New Market Street (by the bridge). Produce when in season. Crafts and handmade and wooden items. Located in an old pecan building. Farmers Market 22049 Main St. Sunday, Oct. 20, 2013 – Thursday, Dec. 31, 2015 (985) 871-5327 12-4pm Website: http://www.townofabitasprings.com Market offers shopping for vegetables and plants, baked goods and prepared foods, food and drink, arts and crafts and live music. The market takes place at the Abita Trailhead Plaza at the Tammany Trace, home to the Trailhead Museum and historic pavilion, playground and water feature, all in the heart of Abita Springs. The Houma Mainstreet Program and the Gulf Coast Marketplace is excited to announce the Downtown Houma Farmers, Fisherman and Artisan Market to begin on Saturday, May 12, 2012 at the Bayou Terrebonne Waterlife Museum grounds (7910 Park Avenue, Houma, LA 70364). The market will offer seasonal and local foods, seafood, and works created by local artisans for sale. The market will be held weekly every... Saturday from 8am-1pm and is open to the public. Operating most Saturdays 8-12 at the Waterlife Museum and Memorial Park in Downtown Houma, 7910 Park Avenue, Houma, LA 70364. Open Air Farmers' Market Festival, Magdalen Square (located center of downtown area). 8AM - 1PM on March 30, April 13, May 4, May 18, June 8, June 22, July 6, October 5, October 19, November 16, November 30 and December 7. Fresh Eggs, Seasonal Produce, Canned Goods, Baked Goods, Homemade Fudge, Arts and Crafts, and more. Debbie Garrot, Manager. For more information contact Tourist Commission 337/898-6600. Kaplan Farmers' Market Days & Times: Held the 2nd Saturday of the month Location: Turnley Park Hours: 8am-noon Phone: 337-643-2400 www.mostcajun.com Open air market with local produce and baked goods. Farmers Market on Giles Street. Across from the Post Office. Monday throught Saturday 8:00 a.m.
Berry Sweet Orchards: Travel north of Baton Rouge to the town of Ethel, and you’ll find Louisiana’s first “state-certified organic you-pick” blueberry farm. Hillcrest Blueberry Farm: At this large farm south of Gloster, you can pick blueberries and blackberries and select other berry items from the store located in their state-of-art processing facility. Blue Harvest Farms: You’ll find Premier, Brightwell and Powder Blue blueberry varieties at this chemical-free farm in Covington. Blahut Strawberry Farm: Pick a gallon of strawberries at Blahut in Holden, and then head to nearby Tickfaw State Park for a picnic. Landry-Poche Farms: This pick-your-own strawberry farm in Holden is home to the 2013 Strawberry Festival king. Louisiana Herbs: In Riverton, south of Monroe, you can collect pecans; pick mint, basil and other culinary herbs; and even buy plants on Breston Plantation. Liuzza Produce Farm: Take a guided wagon tour to see what’s growing on the Liuzza farm in Amite. Depending on the season, you may have the opportunity to pick strawberries, squash, zucchini, cucumbers, tomatoes and more. In the fall, choose a pumpkin off the vine. Call before you visit.